The National Association of Insurance Commissioners (NAIC) has found that half of U.S. flood losses occur outside the designated high-risk areas, and a Lloyd's of London report found only 1 percent of properties outside of the defined flood zones have flood insurance. EVERYWHERE IS A FLOOD ZONE! Q: Do I have to be a member of the PIA to take advantage of this service? A: Yes. It's quick and easy to join the PIA and take advantage of all the benefits of membership. Did you know that if you are a member of the PIA Western Alliance that you are also a member of PIA National, too? That means even more benefits - find out now. Q: How do I become a PIA Western Alliance member? A: We can get started right now! Contact Lori Elston at PIA Western Alliance at (888) 246-4466 x124 or email. Q: Why should I move my flood book over to The Hartford? Dedicated book roll consultant who will work with your agency to determine the most efficient way to move your flood book to The Hartford. Hartford will collect required documentation needed. Hartford will bill existing clients 90-days prior to the expiration date. Hartford will customize a renewal letter on your agency letterhead. Hartford bill is sent along with agency-specific renewal letter instructing your clients that you, as the agent, are moving their federally-backed flood policy to Hartford and to pay enclosed bill. Once your client pays their Hartford bill, policy is issued on Hartford paper? Q: Is the enrollment process easy? A: Yes, very easy. Not only that, you'll be sure to get the best-in-class service that The Hartford is known for. Dedicated, local sales director for your territory to connect with and help grow your flood business. Training and continuing education credits - to help you understand your coverage. User-friendly, online access to processing systems - quoting, submissions and endorsement request plus, free zone determinations. Online chat for service questions and interactive, real-time input assistance. Q: Where is this program available? A: This program is available in all 50 states, the District of Columbia and Puerto Rico. Q: What is offered through the Hartford's Flood Insurance Service Center? Q: Is there Hartford Marketing support? A: Yes! PIA members have access to the Flood Insurance Marketing Support Center. The Hartford marketing support center will help you improve your agency's flood sales operation. The Hartford is a participant in the federal Write Your Own (WYO) Program, part of the National Flood Insurance Programmanaged by the Federal Emergency Management Agency (FEMA). WYO flood policies are underwritten by the federal government and issued, sold, and administered by authorized private insurance companies, including Hartford Fire Insurance Company, Hartford Fire Insurance Company of the Midwest, and Hartford Underwriters Insurance Company. Accordingly, Hartford WYO flood policies are written subject to the rules, regulations, terms, conditions, and availability of the National Flood Insurance Program. Interested in learning more? Contact Lori, today, at 888-246-4466. Private flood insurance now accounts for less than 5 percent of the residential market, and most private flood insurance policies cover commercial properties or residential properties that need coverage above the $250,000 limit on National Flood Insurance Program (NFIP) policies. Treasury and the FDIC have already indicated their approval of the rule. If it is additionally approved by the Federal Reserve, the Farm Credit Administration, and the NCUA, the final rule will become effective on July 1, 2019. The promulgation of the rule is required by a provision in the Biggert-Waters Act of 2012, which reauthorized and reformed the NFIP. The uptake of private flood insurance in the United States continues to be low due to such factors as lack of risk models, low consumer demand, high private premiums, and the availability of relatively inexpensive government-sponsored insurance. During Hurricanes Harvey and Sandy, less than 20 percent of the houses that were flooded had flood insurance, highlighting the protection gap for the flood peril, says Risk Management Solutions' (RMS') Robert Muir-Wood. Who wants to earn 20% commission? Curious as to how this can work for you? We'd like to discuss next steps! On demand training and continuing education credits. Competitive PIA member commission rates. We'd like to discuss next steps with you! Have a question? Ready to enroll? Learn more? Tap on the banner to visit our website! Need a New Flood Insurance Carrier? 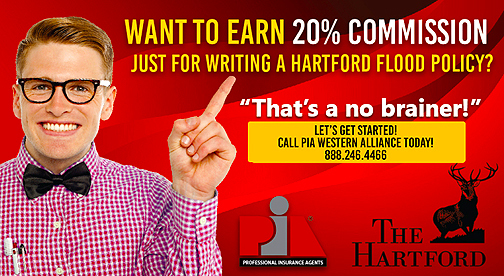 PIA Western Alliance Suggests The Hartford. 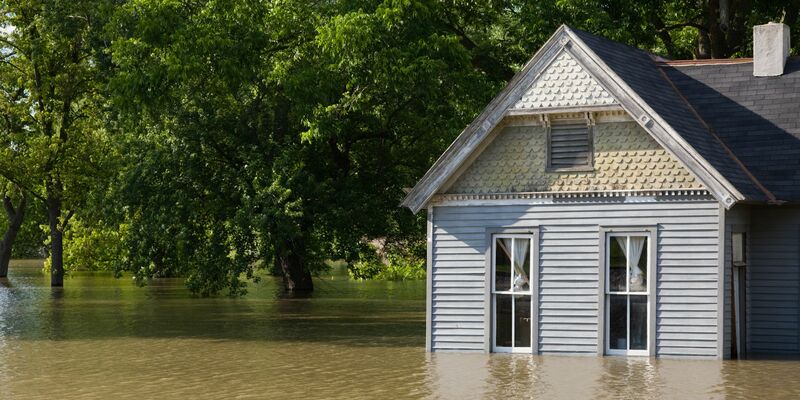 Changes in the flood insurance marketplace are continuing. 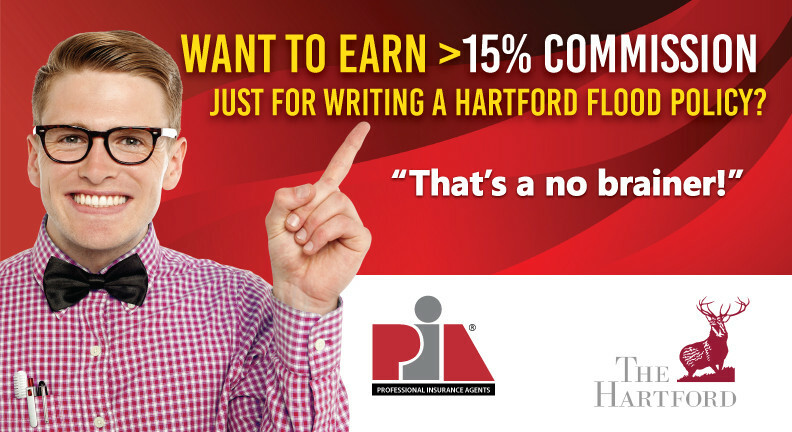 As some carriers leave the market or sell their books of business, we want to assure you that PIA’s national flood partner, The Hartford, is here to stay. The Hartford is one of the largest flood insurance writers in the country, having written flood insurance through FEMA’s National Flood Insurance Program for over three decades. As a participant in PIA National's official flood insurance program, you have the power of PIA behind you. Our dedicated staff is here to help should you need assistance. Furthermore, participating PIA members have access to the Flood Insurance Marketing Support Center -- a PIA member-only benefit. The Standard program includes a web-based application process with your agency doing the customer service administration with Internet and live customer service support. With this web-based program, you can keep policy quotes on a local PC and print policies and endorsements, right in your office. In addition to complete training materials, you will also receive agency production reports. With The Hartford, PIA members will receive service levels that significantly exceed federal standards including same day turnaround for Internet transactions and experienced and friendly customer service representatives. Excess Flood Insurance with policy limits in excess of the maximum NFIP limits are property coverage up to $15,000,000 in all states and contents coverage up to $1,000,000. There is no commercial contents coverage excess. CBRA & OPA Areas with eligible properties including residential properties and condominium units and townhouses. The Hartford wants to be your go to flood market for both Personal Lines and Commercial Lines. Their dedicated flood sales and transfer teams want to earn your business by making it easy to do business and providing exceptional service for both you and your customers. Dedicated and knowledgeable book transfer team — they can do the work for you! For questions or more information about the program and how it can fit your agency, contact Joseph M. Surowiecki, Jr. of The Hartford at 860-547-5006 or joseph.surowiecki@thehartford.com or contact your local Hartford Flood sales representative directly. Hartford Fire Insurance Company of the Midwest, and Hartford Underwriters Insurance Company. Accordingly, Hartford WYO flood policies are written subject to the rules, regulations, terms, conditions, and availability of the National Flood Insurance Program. Have a question for PIA? Contact meat alexipa@pianet.org.